Each year CIFE awards prizes to students who have excelled in a specific field, and it also awards College Prizes to students who it has been a particular pleasure to have in the college community. 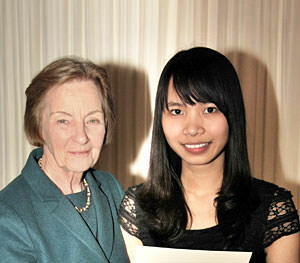 Sophia Nguyen, shown here with CIFE President Baroness Pauline Perry, joined us in January 2011 to start AS level courses in Accounting, Chemistry, Economics, Maths and Further Maths, having previously studied in Vietnam. After an excellent AS year she continued with Chemistry, Economics, Maths and Further Maths. In summer 2012, Sophia achieved grades A*A*A*A*. She also took AEA in Mathematics achieving a Distinction. Sophia is now at Warwick University reading Economics. Sophia has been a joy to work with both academically and socially and we’re delighted that she has won a CIFE College Prize.